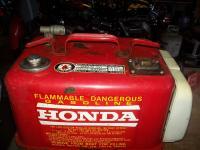 Honda gas tank, OEM metal.3.4 gallon for smaller Honda outboards. Inside clean, (factory sealed), some spots outside from storage getting banged around. $40 firm, in Oly, out by Steamboat Island.